No to-be-expected teddy bear or ladybug costume for your little one. This unique shrimp jumpsuit will be a hit for your babe. And what pasty-faced infant doesn’t look good in orange? It’s cuddly, it’s cosy, it’s easy to put on––just stuff junior in and zip it up. 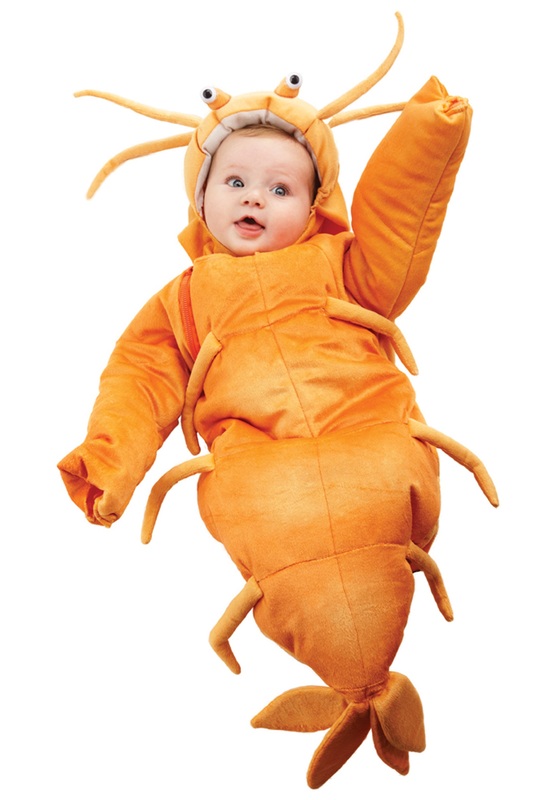 You could serve a bunch of hors d’oeuvres at your party, or you could just dress up your child as a shrimp. “Hey, where’s the shrimp?” Hold up your kid. Who could complain at a sight so cute? Even if your guests are miffed, they’re familiar enough with social convention to smile and laugh at your baby. It might not actually solve your problem of what to feed your guests, but your tyke will look good enough to eat. With cocktail sauce. Actually, you might want to make sure guests know your little one’s not on the menu for the evening! And you might wanna keep a close eye on the proceedings anyway. If you’re really attention-starved, take your costumed baby to Red Lobster––just don’t let them get in the aquarium or someone might pick ‘em. After all, they’ll probably be bigger than any of the lobsters in there! If they get feisty at home, just put rubber bands around their little claws! This tip works in and out of this costume. If you notice you’re starting to default to the lifeless shrimp eyes rather than the windows to your child’s own soul, it might be time to give the Shrimp Baby Bunting a quick rest.